LEO constellations such as OneWeb or SpaceX continue to see Internet to the masses as a primary target market. However, for this market to materialize, the whole ecosystem must align, and antennas (among other elements) are still a big unresolved issue for consumer-grade services. In which direction are market forces and incentives pushing the development of flat panel antennas (FPAs)? 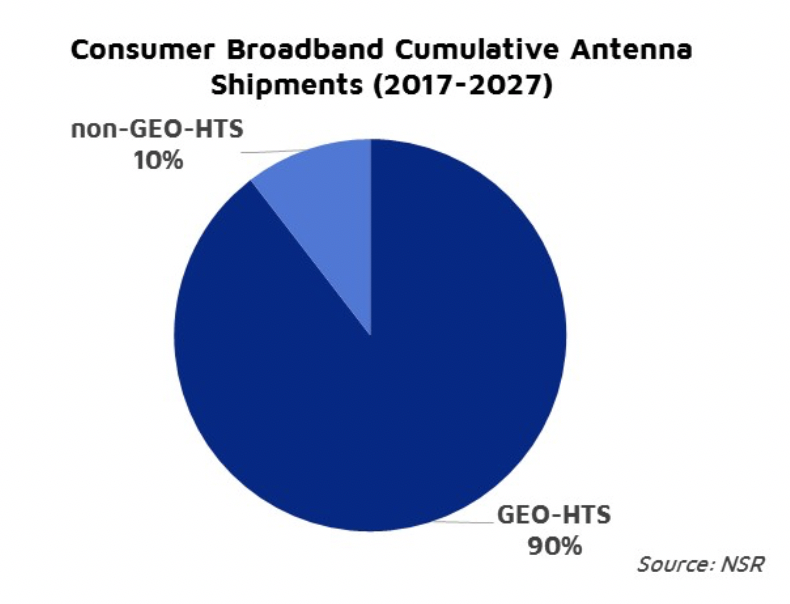 According to NSR’s Commercial Satellite Ground Segment, 3rd Edition report, antennas will generate $44.9 billion cumulative revenues in the next 10 years. Requirements are wide and varied, from low-cost, fixed parabolic dishes for DTH (can be as cheap as $10 USD), to highly sophisticated antennas for mobility or Earth Stations that can cost several $100k USD. Consequently, antenna vendors adapt their products to the most lucrative markets. LEO constellations have a particular set of requirements that favor FPAs, especially in the low-end markets, but are FPA incentives aligned with LEO Constellations? 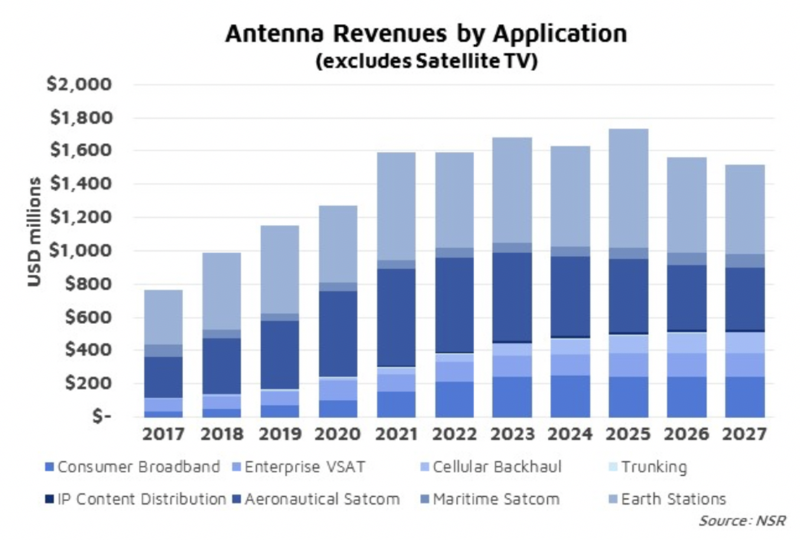 Beyond the extraordinary volumes generated by Satellite TV, verticals with complex requirements such as Earth Stations and Aeronautical connectivity will generate the highest share of revenues for antennas. However, FPAs are still far from meeting the throughput requirements of Earth Stations and other high-throughput verticals like Backhaul. This explains why parabolics are still the solution for these kinds of applications, even in NGSO systems (O3b). On the other hand, characteristics of FPAs seem to align very well with the requirements of the Aero market in terms of throughput requirements: low-profile… The high level of revenues to be captured from Aero is making FPAs vendors tune their products for this vertical. However, the emphasis on some elements (mass, power, heat) and the relatively low incentive to reduce cost for this vertical hurt the development of FPAs for other use cases. The cost of low-end parabolic antennas will be almost impossible to match by FPAs. Manufacturing and material costs are extraordinarily low. Parabolics are essentially a metal pan with RF engineering behind and, when produced in large scales, can go as low as $20-30 USD per unit. Having said that, this is only one element in the total Subscriber Acquisition Cost (SAC), and some of the features of FPAs (auto-acquire, form-factor) could have a positive effect on other elements. Today, SAC in Consumer Broadband is around $700-1,000 USD where the modem might be in the $300 range, antenna itself around $50, installation contributing $100 and the rest being marketing, credit validation and others. Consequently, an FPA priced in the $200-300 range could compete with traditional parabolics considering lower installation and marketing costs (product placement). Even considering these factors, prices for FPAs are still far from this benchmark, and only the architectures that have no other option (LEOs, Aero) will choose FPAs in the short to medium term. Mass production of FPAs would certainly have a major contribution to reducing the costs of antennas (amortization of R&D investments, materials, manufacturing techniques). Their current price points limit the market they can target, leading to a “chicken and egg” dilemma, especially if we consider that they won’t be able to compete in the low-end GEO space in the early stages. By mid-2020s, with LEO constellation programs ramping up, FPAs could gain enough traction to scale and lower prices, unlocking new markets in a virtuous cycle. This will coincide with the maturity of verticals like Aero generating a shift in focus for FPA vendors. Constellations continue to see consumer broadband as a one of their key markets. To reach those markets, a cheap and performing FPA antenna is necessary. However, incentives for these systems are pushing developments into other directions such as Aero connectivity because of a higher initial revenue opportunity. It will be impossible to see FPAs beating low-end parabolics in a direct cost comparison but, when including other elements of SAC, the equation is not so unfavorable. With continuous technology development, greater traction from LEOs and stagnation in verticals like Aero, we could see consumer-grade FPAs by the mid-2020s, at the earliest. Ground Segment is no longer just “support infrastructure”, it is now a critical competitive advantage. Players in the constellation sphere have placed significant emphasis on developing the Space segment, even internalizing manufacturing processes. But the real bottleneck (and future differentiator) for these systems to reach volume markets is the ground segment. Investing in developing such technologies will ensure a smoother path to market. NSR supports equipment vendors, service providers, satellite operators, end-users and financial institutions in their technology and business strategy assessment and planning. Please contact info@nsr.com for more information.